It is a pity we dont get good photos for this. And what tiara will Meghan use? sorry but I hope she's not invited. It wasn't expected that the Sussexes would go to the Diplomatic Reception. The Queen and her direct heirs attend it. Kate and William for the past few years. Harry hasn't ever been. They'll go to tiara events like State Dinners though. The Harry van Straubenzee Carol concert has always been held on or around the 4th/5th of December and Harry/Meghan have probably been pencilled in for that for months. Oh boy. The trifecta returns- smirking, hanging all over Hazben and belly cupping. ^ The Queen had a reason for doing this!! I think Kate looks pretty dreadful. The dress is lovely but she is stick thin and has hard, masculine features, so she really doesn't suit soft colours and delicate fabrics. Her make up also looked really bad and overdone in the camera light - too much blusher. 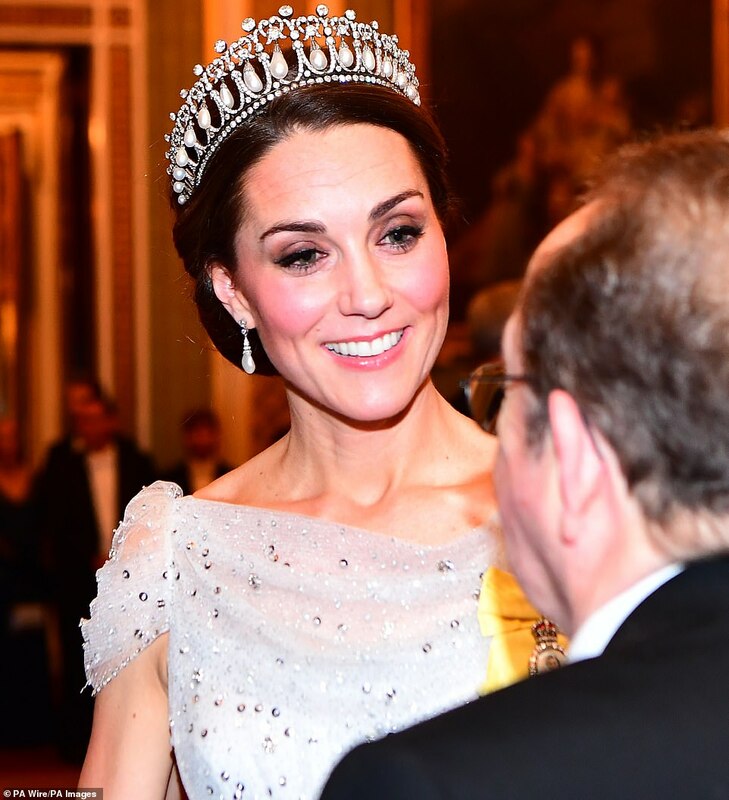 This may be an unpopular opinion but I dislike the Lover's Knot tiara, at least on Kate. It's too showy. ^ I agree. I think the Lover's Knot is too big for Kate. She looked good in the small tiara she wore on her wedding day. 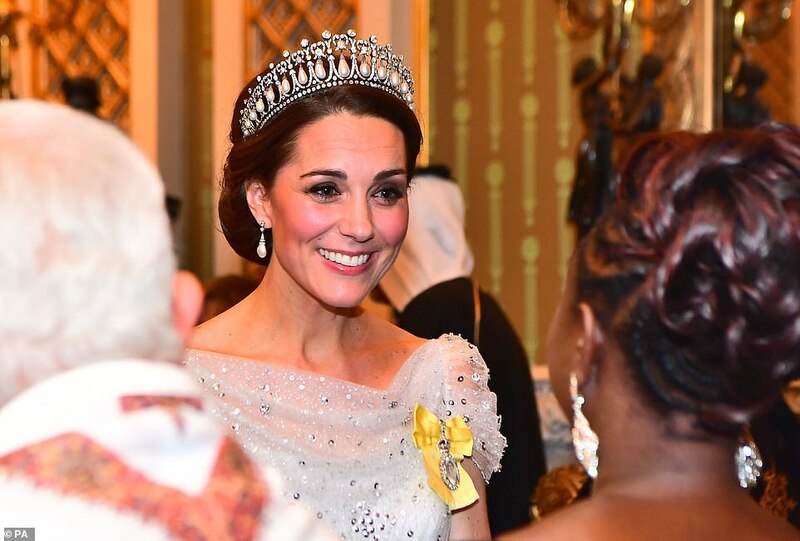 I get that William is probably wanting to honor his mother, but a smaller, more delicate tiara would suit Kate much better. I think it's all part of her weird Diana 2.0 thing, the Lover's Knot. And because she's Catherine Cambridge. But yeah, bigger is not better on Kate. ^^^ I partly disagree. Kate is too thin and masculine and harsh looking, but the soft colours & delicate fabrics even that out and make her softer. I think I like this dress, at least the bits I see in these pics. Can't help but think it's another Diana copy though, reminds me of the recently "unearthed" dress that's being auctioned off right now (again). The make-up is slathered on, M needs to lay off the bronzer and K off the blusher, but K's makeup is much better than in the first couple of years when she used to line her whole eye very harshly and very heavily. I think she looks better with the lover knot than with the wedding tiara. Maybe I would give her one of the fringes. Doubtful she will ever wear a smaller one again since she's got her man hands on the Lovers Knot. Yep Diana 2.0. She has worn another tiara other than the Lover's Knot. Smaller -- I can't remember the name -- but I didn't like it on her, either. But that's been a while back and Kate had no confidence. You have to be confident when wearing the bling. She seems more at ease and confident now, so that tiara might look good on her. I'm sure some of you remember the name. I think I just need to go to London and sort through all the jewelry and tiaras and pick out the perfect ensemble for Kate. 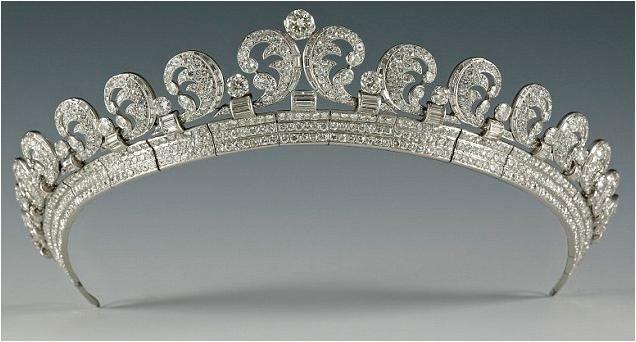 ^ it was the lotus tiara. I would be careful if I were Kate in case Meghan decides she likes the lovers knot...and Harry has a tantrum. Does Princess Anne still go to these dinners? ^^ Harry threw a tantrum over the emerald tiara, and Granny ignored him and handed Meggles what Granny wanted to hand her. I think Meghan will end up going with the diamond bandeau tiara she wore at the wedding, and (if she's allowed) the emerald tiara. I prefer the diamond bandeau anyway. I bet Meghan will also be gunning for the Kokoshnik tiara.